Saratoga Partnership brings together the talents of a dedicated team of professional agronomists with decades of combined experience in crop production, land management, agribusiness management, and sustainable environmental farming methods. The team holds four degrees in agronomy, two agricultural studies degrees, and advanced certification from the Executive Program for Agricultural Producers (TEPAP) from Texas A&M. Check out our featured article in Top Producer Magazine, Live, Laugh and Farm! Saratoga Partnership started from humble beginnings. In 1958, Lawrence and Elsbeth Richter, along with their three sons, bought the home farm. But getting there wasn't easy. In November, 1958, Lawrence drove the Allis-Chalmers WD-45 tractor towing two small wagons 220 miles from Germantown, Iowa to the farm near Lime Springs, Iowa. Those wagons were loaded with everything you could imagine! The first day brought good weather and Dad made it to Britt, Iowa, in late evening. He recalled waking up at 2:00 am to the howl of strong winds. At dusk, he arrived in Osage and completed the last 30 miles in darkness and frigid cold. I have always marveled at that trip. The WD-45 had a top speed of about 10mph. And the two wooden box wagons had no reflectors, let alone flashing lights. I also wonder what his thoughts were along the trip. He was moving his family across the state, away from friends and family to an unknown area where he would be truly on his own. He realized times would be difficult - and it would be very difficult - but he had a dream to own his own farm. Today, we still have the WD-45 and both wagons to remind us of the power of his dream. What's with the Pink Flamingo? There are a lot of people trying to get your attention these days. So, over the last few years, we've been wracking our brains trying to think of a way to help our communications stand out from the crowd. We knew we needed to update our farm logo ... the image that helps people think of us when they think of a leased farmland cropping operation. With the the help of Monsanto, we were able to work with Monsanto branding specialist, Donna Heckler. Donna met with the team for a day to discover who we are and how we could differentiate ourselves from our competition. That process was a lot harder than we ever imagined! It took about three hours to discover that who we are and how we are different didn't really have to do with farming. It's really about how we approach our relationships with landowners, vendors and suppliers. Over the course of our meeting, we discovered our core value isn't business oriented. It's actually very personal in nature. You see, we enjoy our relationships with the people we do business with. And they enjoy their interactions with us. In fact, many of our relationships started as business transactions - like renting land, buying equipment or supplies, and selling produce. And those relationships evolved over the years into close and enjoyable personal friendships. If "fun" is our core value, how do we design a logo that represents an idea like "fun"? We worked with a graphic designer to come up with various ideas for fun. Everything from sunsets to tractors to corn were considered. Finally, a flamingo was introduced as representing fun. Corn plants were added to symbolize what we grow. We think the final version helps Saratoga Partnership stand out in a crowded field of competitors. And it tells you our core value is to have FUN in our business relationships with you, our landowners and corporate customers. 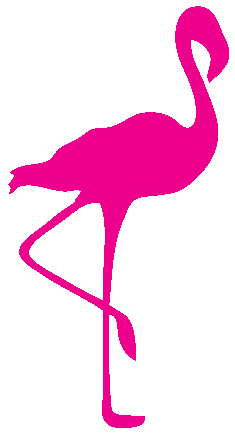 You'll be seeing our pink flamingo on everything we use to communicate with you ... our business cards ... our web site ... even on the machinery. So be on the lookout for a pink flamingo in a freshly planted field of corn near you! Tim Richter has been farming for over four decades. Tim graduated with honors from ISU with a BS in Agronomy and has completed the Executive Program for Agricultural Producers (TEPAP) from Texas A&M. 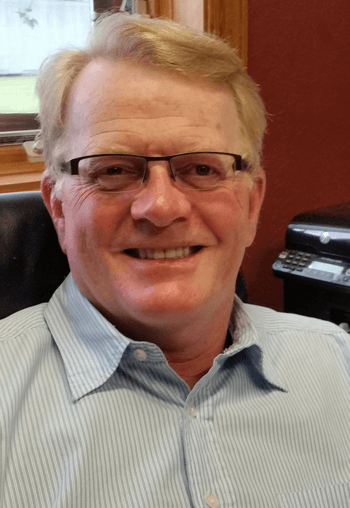 If you'd like more information about leasing your farmland to a professional crop production company, please call (563) 380-7744 or contact Tim using our convenient contact form.